This website is a celebration of the natural history collections in museums in the North West of England, aimed at anyone interested in museums, whether for work or play. It is also a celebration of the fantastic nature we have on our doorsteps in the North West. 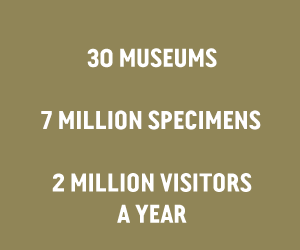 Natural history collections are found in about 30 of the museums in the region, some very big and some very small. Together, they house an incredible 7 million specimens, most of which are kept behind-the-scenes as a reference collection for peoply studying the changing environment. Galleries, temporary exhibitions and events attract roughly 2 million visitors a year, including people of all ages, and school groups. Natural history museums are great places for people to explore the natural world, developing knowledge and skills to explore and care for living nature. Our museums are places for reflection, learning, discovery, enjoyment and wonder. Natural history collections are also an archive of the natural world, a record of a changing environment, and are used by scientists to answer questions about the natural world. You can find out about the different venues on the Museums page. Find out what inspires those who work most closely with natural history collections on the Blog page. If you want to take your interest into our great outdoors, explore the Nature in the North West page. This website has been developed by a partnership of North West museums with natural history collections, led by Manchester Museum in association with World Museum Liverpool, Tullie House Museum, and supported with funding from Museum Development North West. Just what is so great about natural history museums?